HP’s Officejet 6000 Wireless color inkjet printer may dwell in the shadow of its faster cousin, the Officejet Pro 8000 Wireless ( ), but it has nothing to be ashamed of. For a significantly lower price, it offers good performance and plentiful features, plus cheap inks. Setup was easy, despite a veritable avalanche of dialog boxes for setting up the wireless functionality. On a Mac, you must visit the Preferences/Printers dialog box to add the printer manually—a small task, but one that other vendors’ products have managed to automate. The Officejet 6000 Wireless placed in the middle of the pack on most of our speed and quality tests. On the PC, text pages on plain paper averaged 7.4 pages per minute. A variety of plain-paper grayscale and color pages exited at rates of 3.3 ppm to 3.7 ppm. When we switched to photos using HP’s own paper, prints emerged at 1.9 ppm, the fastest we’ve seen in a while. On the Mac, plain-text speed was 7.45 ppm, versus 1.47 ppm for a mixed text and graphics PDF file and 0.77 ppm for a full-page color photo. On both platforms, text quality was just a hair shy of crisp. Color prints tended to have a more sepia or yellowish tinge, though they still looked natural. Our grayscale image seemed a little greenish and grainy. A full-featured, fairly sturdy design distinguishes the Officejet 6000 Wireless. The printer’s top lid (for access to the ink cartridges) is flimsy, but the rear-mounted automatic duplexer enhances the overall stiff build of the printer. A flip-down rear door lets you peek into the paper path in case of a jam, or you can pull out the unit completely for deeper access. The simple, 250-sheet input tray has a sliding width guide on the left. Its lid doubles as the 50-sheet output tray, with a somewhat bendy pull-out extension for catching pages. On-printer controls consist of just three buttons: resume, cancel, and wireless. The last toggles wireless on and off if you press and hold it; if you push it quickly, it prints out network settings. The inks are reasonably priced. Standard-size (HP 920) cartridges ship with the unit. Replacing the black ink costs $19.95, or 4.8 cents per page. The 300-page cyan, magenta, and yellow cartridges cost $9.99 apiece, or 3.3 cents per page. A page with all four colors would cost 14.7 cents. The high-yield, 920XL cartridges are a much better deal: A 1200-page black cartridge costs $31.99 (2.7 cents per page), while each 700-page cyan, magenta, or yellow costs $14.99 (2.1 cents per color per page). A four-color page would cost an economical 9.1 cents. The Officejet 6000 Wireless represents a step down in speed from the Officejet Pro 8000 Wireless, but it has nearly identical features and print quality. 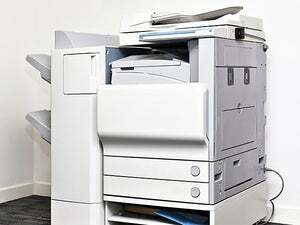 It would be a good inkjet printer deal for many small, low- to mid-volume offices on a budget.